Job creation was slightly stronger than expected by economists in August (+201,000 versus +190,000 expected), but the 3 month average of payrolls growth fell to its lowest level since the end of last year thanks to large downward revisions to June and July data totaling a decline of 50,000 versus what had been previously reported. 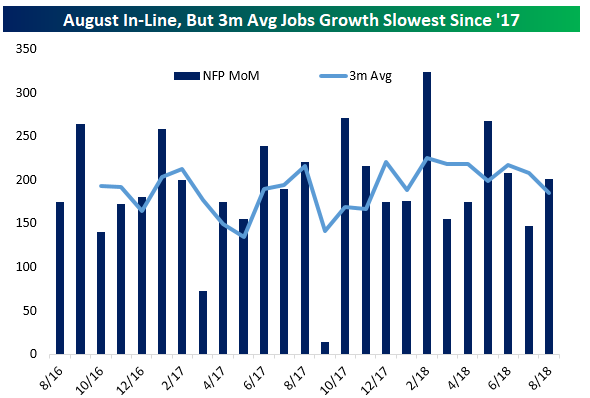 YoY jobs growth is once again slowing after a modest late-expansion uptick which had peaked as-of June. 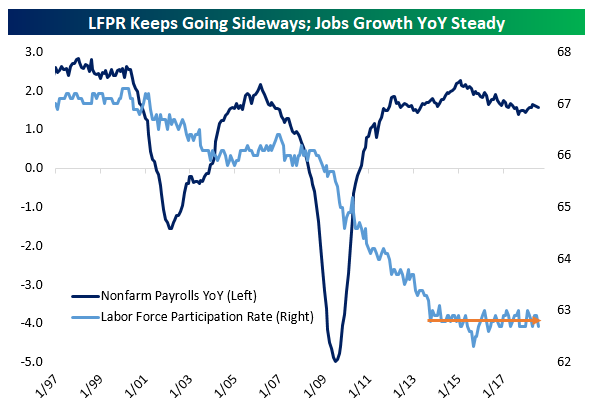 While jobs growth has slowed, it’s still rising at a very healthy pace on an annual basis. Despite ongoing jobs growth, the labor force participation rate has been basically stable for the past 5 years. One reason the LFPR is not rising along with employment is demographics: as the labor force ages, there are large outflows from employment to non-participation thanks to retirement. For instance, on average over the last 12 months, 3% of employed workers have left the labor force entirely. If they had been fired outright, it’s very unlikely they would not start looking for work immediately. Hence, the stability of the LFPR is almost entirely a demographic effect. 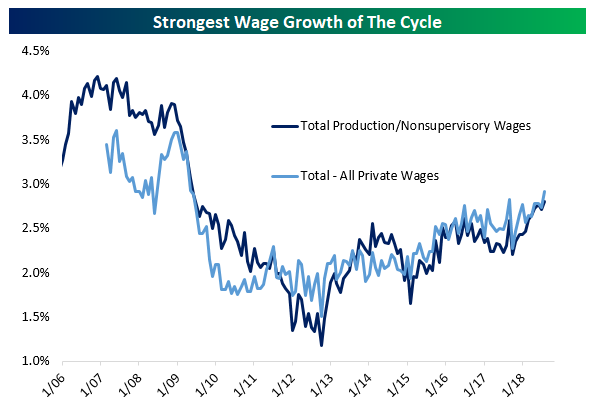 Saving the best for last, this was the strongest month of the expansion when it comes to wage growth. Total private wages rose 2.9% YoY, while production & non-supervisory wages (for non-managerial workers) rose to 2.8% YoY, fractional new high on an unrounded basis (+2.80% versus +2.77% in June). While job creation has slowed a bit, wages are continuing their slow process of acceleration after years of extreme weakness post-recession.